In 2014, Dubspot partnered with Dub Champions Festival to debut the first annual west coast edition of the festival with a series of music performances and educational workshops. In this video recap, we present highlights from the ‘Dub and Bass’ workshop with veteran music producers and heavyweight dub luminaries, Adrian Sherwood and Mad Professor. Hosted by Emch of Subatomic Sound System. The first annual West Coast appearance of the Dub Champions Festival featured a Dubspot ‘Dub and Bass’ workshop with Adrian Sherwood and Mad Professor in conjunction with the opening of the Dubspot LA school. The festival presents music performances and educational workshops spanning from the reggae roots of dub to the future of electronic bass music. Based out of the UK, both Adrian Sherwood and Mad Professor have played a crucial part in the expansion of dub-style production beyond the scope of reggae. They have worked with artists including Massive Attack, Mala, Nine Inch Nails, Sinead O’Connor, Perry Farrell, Damian Marley, and many more. This workshop focuses on the analog mixing gear used in dub production and features demonstrations on how to perform a live dub mix from both Adrian Sherwood and Mad Professor. Adrian debuts several tracks featuring the recently deceased Jamaican drummer Style Scott, who is famous for playing in The Roots Radics and Dub Syndicate. His recordings appear on some of the all-time greatest dub albums from Scientist, Lee “Scratch” Perry, and Adrian Sherwood. Arguably, his drum patterns are the blueprint for the beat that would become the foundation of dubstep. 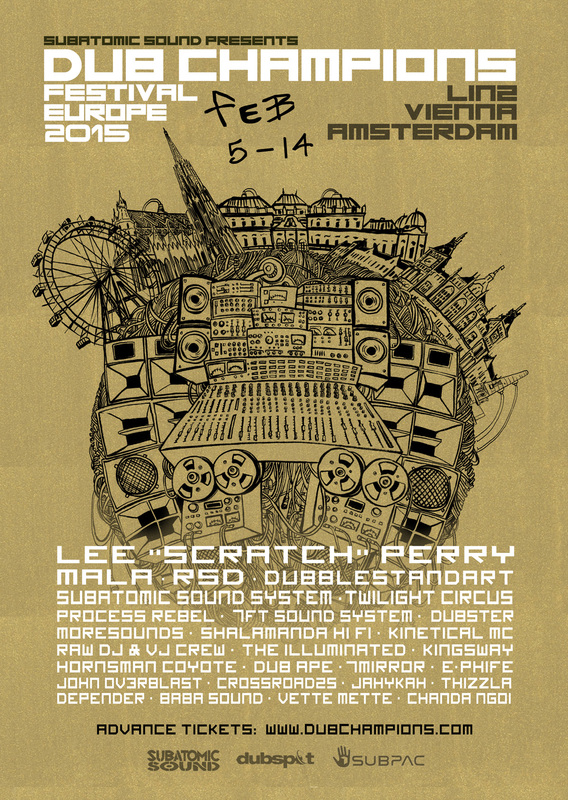 The Dub Champions Festival was founded by Dubspot instructor, Emch of Subatomic Sound System. For the past four years, Emch has been working as a band leader in the USA for renowned Jamaican reggae producer and dub originator Lee “Scratch” Perry. Perry has collaborated with both Adrian Sherwood and Mad Professor extensively over the years. Together they have appeared at nearly every Dub Champions Festival and will perform with Subatomic Sound System at the upcoming Dub Champions Festival Europe in Vienna, Feb 5, and Amsterdam February 13, 2015. Earlier in 2014, Scratch Perry stopped by Dubspot NYC to bless the school and meet the students before heading to a studio session with Adrian Sherwood and Subatomic Sound System. Check out the video here. The festival has been running in NYC over the past four years and in Europe for the past three years. Adrian Sherwood and Mad Professor have both performed and held workshops at previous festival events over the years, both in the US and Europe. You can check out past workshops they have done for the festival in association with Dubspot below. Mad Professor Video Interview + Workshop Recap – London’s Mad Professor, the dub icon who founded Ariwa Sounds, visited Dubspot NYC to present a live, streaming workshop covering his signature sound. Adrian Sherwood Interview + Workshop Recap – Esteemed producer Adrian Sherwood, the founder of On-U Sound, came to Dubspot NYC to present a live, streaming workshop. Dubspot ‘Dub & Bass Master Class’ w/ Pinch and Adrian Sherwood @ Dub Champions – In this video recap we bring you some highlights from last year’s Dub & Bass Master Class with Pinch and Adrian Sherwood at Cielo nightclub. The third annual Dub Champions Festival Europe kicks off February 5th featuring more than 30 artists and free educational dub workshops.